Beautiful evening cruises to the historic and illuminated Speicherstadt and through the sea of lights of the Port of Hamburg. 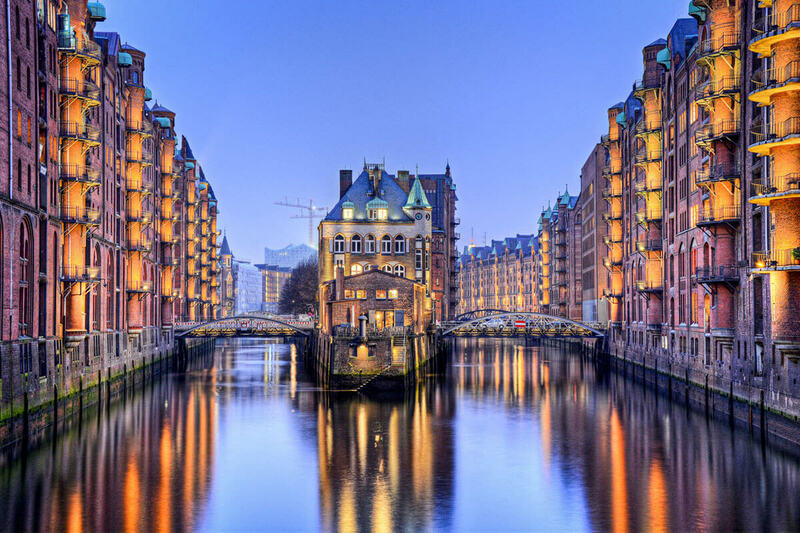 The route is depending on tides (low tide and high tide in the Port of Hamburg), therefore our experienced skippers decide before the cruise if the way through the canals of the historic Speicherstadt is possible. Please announce yourself at our harbour tour pavillion at the St. Pauli Landungsbrücken, Brücke 1, on the top of the promenade. Our staff is happy to give you information which ship of our fleet we use for the light cruise and where the exact place of departure is. We offer interesting evening cruises at big maritime events in Hamburg as the Hafengeburtstag, the Hamburg Cruise Days or on New Year’s Eve. St. Pauli Landungsbrücken, Brücke 1 on top of the promenade (pavillion) and St. Pauli Landunsgbrücken, Brücke 4, down at the water. For more information and a comprehensive personal consultation, even for your private or business events exclusively on one of our ships, please contact our event team. Ahoy – we are looking forward to seeing you! Please indicate the date on which you want to take part in the lights journey (departure times, etc.) at your booking. Furthermore, please be aware that the sending of the tickets and a payment of these per bank transfer takes a processing time of about 3 working days – thank you for your understanding.